As day breaks on the campground outside Rich Stadium in Orchard Park, New York, on July 4, 1989, great grey and white clouds billow and blow across blue skies. Rain is in the forecast, and you can see the storm gathering ominously like some Spielberg special effect miles away. This is fertile Grateful Dead country, and today the Dead will be celebrating Independence Day here with their loose and colorful tribe. They've been coming up to the Buffalo area regularly since the spring of 1970, when they played a benefit gig with the Buffalo Philharmonic at Kleinhans Music Hall (the only time they ever tried that kind of musical marriage). Since then there have been numerous shows in venues ranging from the intimate Shea's Buffalo Theatre to the venerable War Memorial, but there have also been many in Rochester, just a little over an hour away--the most recent was last year at Silver Stadium, a minor-league baseball park, which is tiny compared to this cavernous, 80,000-seat behemoth that is home to the Buffalo Bills. This is the second stop on a summer tour; thousands caravanned here yesterday from Sullivan Stadium in Foxboro, Massachusetts. Most of the crowd, though, is local--or at least from Upstate New York--here because the rock 'n' roll circus is in town. A few hours before showtime, all the action is in the vast expanse of parking lots surrounding the stadium, along Abbot Road, and also on the smaller arteries that feed the area. The fabulous rainbow of sights and sounds that is this scene seems pretty mellow today, which is a good thing, since there have been concerns. Since the early '80s, the nomadic cities that have spring up at every stop on the Dead's tours have gotten larger and larger. What started as a few people selling homemade crafts before and after concerts, primarily as a means of earning enough scratch to make it to the next show, has evolved into a massive, sprawling, unwieldy, and highly commercial bazaar that attracts thousands of curious but ticketless people to every venue. Certain municipalities have been complaining for some time; a few have threatened to ban the Dead altogether. This actually started a few years back, but it's been magnified since the Dead hit the Big Time in the summer of '87, when they had their first Top 10 album (In The Dark) and single ("Touch of Grey"). A few weeks ago the band even sent out a letter to the thousands of Deadheads buying tickets by mail order for the summer tour, urging them to be respectful of the cities they visit: "It's a game to travel through America, and we don't make the rules--after all we're just passing through...Nothing but footprints. It's that simple. We're not kidding," the signed communique admonished. Inside, the field is slowly filling up as fans spread out blankets and tarps to stake out some turf for late-arriving friends. About 50,000 people are expected this afternoon--that's about two-thirds capacity, which is a good thing. That way, everyone has the room they need for dancing and hanging out, and the venue security is able to relax a bit. Hassles are virtually nonexistent. For this tour there's a splendid, riotously colorful stage set that completely overwhelms the stadium: designed by a renegade Czech artist named Jan Sawka, the set stands 67 feet at its highest point, is 144 feet across, and nearly 50 feet deep onstage. It encompasses 58 multicolored banners depicting phases of the sun and moon above the stage, bold color patterns behind the band, and two 30 x 40 screens dominated by great green trees on the two main speaker stacks. Once night falls, it all becomes a wonderous playground for the incredible improvisational artistry of Dead lighting director Candace Brightman. By the time the show's opening act--10,000 Maniacs, from nearby Jamestown--has left the stage, the sun has mostly disappeared behind clouds, and it's clear that rain is inevitable. 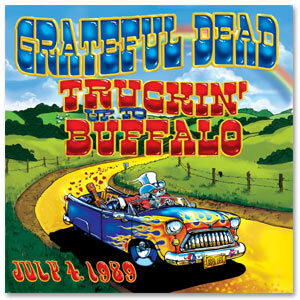 Nonetheless, the crowd is up and dancing as the Dead charge confidently through a first set dominated by old favorites, including the slam-bang opening of "Bertha," followed by "Greatest Story Ever Told," a dreamy version of "Row Jimmy," and a potent nod to Dylan, "When I Paint My Masterpiece." It seems more like fate than coincidence when the sky opens up and rain drenches the crowd for the first time during "Looks Like Rain," but no one is complaining as "Deal" brings the set to a soggy but rapturous conclusion. The rain mostly stays away for the first half of the second set, during which the Dead roll through tight versions of "Touch of Grey," "Man Smart, Woman Smarter," and the powerful ballad "Ship of Fools." Then it's on to a gripping "Terrapin Station" by way of a reprise of "Playing In The Band," a song they "started" at Foxboro two days ago. During the "Drums" and "Space" portion of the show, the gargantuan stage set seems to come alive and even levitate mysteriously; truly, this is music of the spheres. And, as if on cue, the heavens open again for a short period. From there, it's into the swirling sonic maelstrom of "All Along the Watchtower," an incredibly stirring version of "Morning Dew," and a final anthemic affirmation of love and community with Buddy Holly's "Not Fade Away," featuring Jerry and Brent trading riffs and smiles while the whole stadium rocks like a wooden gym floor. For this Fourth of July there can be no other encore: "You can call this song...the United States Bluuuuuues!" Flags are waving, sparklers are twirling, and after the last notes have come crashing down, the roar of the crowd is drowned out by fireworks exploding against the dark, cloudy sky. Next stop: Philadelphia's Veteran's Stadium on Friday. Start packing, and see you there. This album was released in July 2005. To see this show live, be sure to check out the DVD.